England's last bilateral series defeat came in India in January 2017, with only a freak one-off loss to Scotland in the interim. Nottingham: On a high after an impressive Twenty20 series win, an upbeat India will eye another dominant performance against hosts England in a three- match ODI series, which can be termed as a 'dry run' ahead of the World Cup next year. With cricket's blue riband tournament scheduled to be held in UK next year, the ODI series will give Virat Kohli an ideal opportunity to get a drift about the conditions that his men are expected to encounter at exactly same time next year. While India will be buoyed by their 2-1 T20 series win, England, the top-ranked ODI team in world cricket, come into the series having crushed a below-par Australia 6-0 in their last bilateral engagement. England have been one of the finest 50 over sides in recent times and India will have their task cut against a batting line-up comprising Jos Buttler, Jason Roy, Alex Hales, Jonny Bairstow and Eoin Morgan. Add Ben Stokes to it and England bear a formidable look. It is a reputation built on fearless, attacking cricket that has seen England win 46 out of 69 ODIs since a disastrous 2015 World Cup. Their last bilateral series defeat came in India in January 2017, with only a freak one-off loss to Scotland in the interim. KL Rahul's stupendous form has been a happy headache for the team management and there is a possibility that the captain might come at No 4 in order to give Rahul a chance to make optimum use of his current form. Rahul scored a 70 against Ireland and followed it by an unbeaten 101 against England in the first T20. He will, in all likelihood, be the missing jigsaw puzzle at the top of the order for skipper Kohli. With both Shikhar Dhawan and Rohit Sharma being automatic selections at the top of the order, Rahul, who is also a specialist opener comes in at No 3. 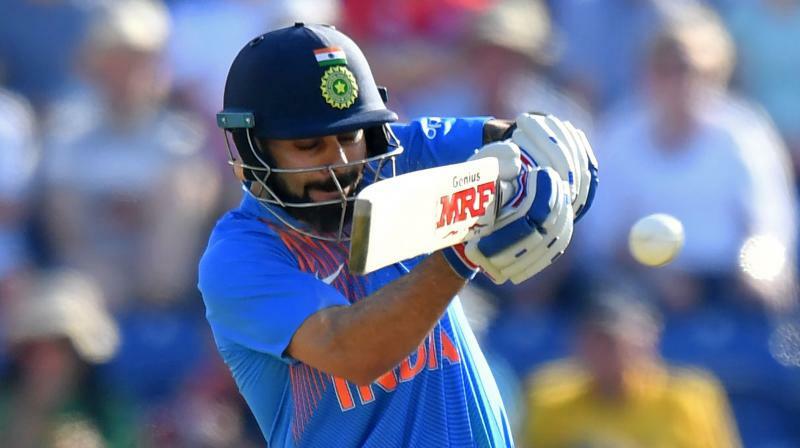 If the same batting order is followed, skipper Kohli, who has been world's best ODI batsman by a distance, will have to drop himself a notch down at No 4. The seasoned pair of Suresh Raina and Mahendra Singh Dhoni along with all-rounder Hardik Pandya are expected to form the middle-order. Yuzvendra Chahal is a certainty as the wrist spinner and Kuldeep Yadav, who has created all sorts of doubts in the minds of the batsmen, may just comeback into the playing XI as the Trent Bridge ground is much bigger than the one at Bristol. If the team management thinks of playing an extra pacer, Siddarth Kaul or Shardul Thakur might come into play. If Bhuvneshwar Kumar recovers from the stiff back, he will be sharing the new ball with Umesh Yadav. For England, the series against Australia was a real morale booster where the team scored a world record total 481 in one of the ODIs. Buttler, whose dream run has continued since the start of the IPL, will like to continue his rich vein of form. He is one of the batsmen, who has been able to read the two wrist spinners quite well. Along with Roy, the duo will like to take advantage of the Powerplay overs knowing fully well that some of the middle order batsmen including Test captain Joe Root and skipper Morgan himself are not exactly picking up Kuldeep's wrong 'uns. Post the Champions Trophy, starting from June last year, India have played 27 ODIs against West Indies, Sri Lanka, Australia, New Zealand and South Africa, both at home and away and at least one wrist spinner has featured in all these games. Kuldeep (39 wickets in 20 ODIs at average 20.02) and Chahal (43 wickets in 23 ODIs at average 21.83) have proved their worth since making debuts but their ultimate test will be against England. The hosts have a penchant for high scores. Since that World Cup in Australia-New Zealand, this English batting line-up has accumulated 300-plus scores 31 times in 69 matches, inclusive of 23 wins. On 11 occasions, they have crossed 350 and have surpassed the 400-mark thrice. It certainly won't be a walk in the park for India. Match starts at: 5 pm IST. ■Watch: Anushka Sharma hugs Virat Kohli as India win T20I series vs England.